One thing most people don’t know about me is that I’m a huge history buff who enjoys reading historical biographies of famous Americans, like Tennessee’s own Andrew Jackson. So when I heard that Nashville Running Tours features a History Tour through downtown Nashville, I had to to check it out. Luckily for me, my friend Chuck is one of the running tour guides and invited me along on a tour. Nashville Running Tours also features tours of Music Row (the Music Tour) and East Nashville (the ‘Stach and Dash Tour a/k/a “America’s first hipster running tour”). For you out-of-towners, East Nashville is as full of hipsters as a Mumford & Sons video, so that tour is kind of an inside joke. We’ve had a cold winter here in Nashville so I was nervous about the weather. I was also nervous about who I might end up running with. Hopefully, they wouldn’t be so fast that I couldn’t keep up because that would be embarrassing. Luckily, even if that happened, I know my way around the city and could always hightail it back to my car if I got left in the dust. But the weather turned out great. It was in the 40’s, clear and beautiful. So one hurdle overcome. Being a chronic early-bird, I got to the meeting spot early. A few minutes after I arrived, I noticed a couple in running garb and asked them if they were there for the running tour. They were, and we chatted for a couple of minutes before Chuck arrived. Brian and his wife Michal were in town from Vermont for the National Conference on Education. They were easy to talk to and I quickly realized I had no reason to be nervous about running with them – I don’t think I could have wished for better people to run with through the City of Nashville. I guess you have to figure that people who sign up for this sort of thing would be fun, right? Chuck arrived and gave us an overview of the tour. After some picture taking, we took off. The tour route began at the spot where Nashville was founded by James Robertson and John Donelson way, way back in 1779. Along the tour route, Chuck dispensed both Nashville history and insider tips (such as the FREE buses that run between downtown, Bicentennial Mall, and the Gulch). I don’t want to give away all of Chuck’s secrets, but he did a great job covering Nashville history as we wound past historical sights on our way through downtown. 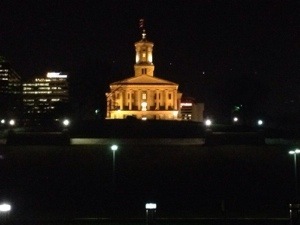 For me, the highlight of the tour was the stunning view of the Nashville skyline from the State Capitol. Seeing my adoptive city at night through the eyes of visitors, Nashville looked more beautiful than ever. Brian and Michal were enthusiastic about learning Nashville’s history. And I learned that my friend Chuck might even be a bigger history buff than I am. Since he’s lived in Tennessee his entire life, he knows a LOT of Nashville and Tennessee history. I learned several historical facts, but I’m not telling you what they are so you’ll sign up for the tour and learn them yourself. Touring Nashville on foot was a wonderful experience for me and I can’t even imagine how special it was for a tourist. Check it out for yourself at NashvilleRunningTours.com. This entry was tagged Nashville Running Tours. Bookmark the permalink.